I had a lovely time at the CO/WY AFS this year so thanks to all of the organizers. I was thrilled to get such positive feedback on my talk about increasing our outreach impact by using an authentic science approach. There were many great talks during the meeting, but I was particularly inspired by Dr. Fausch’s talk about his new book For the Love of Rivers. Check it out. A talented group of eighth-grade scientists from Katie Guilbert’s class at Bella Romero (Greeley, CO) presented original research about exploratory behavior in guppies at a local conference this week at CSU. They did an amazing job and I’m so very proud to list them as collaborators. A big thanks to the Front Range Student Ecology Symposium for giving us the opportunity to share our research. 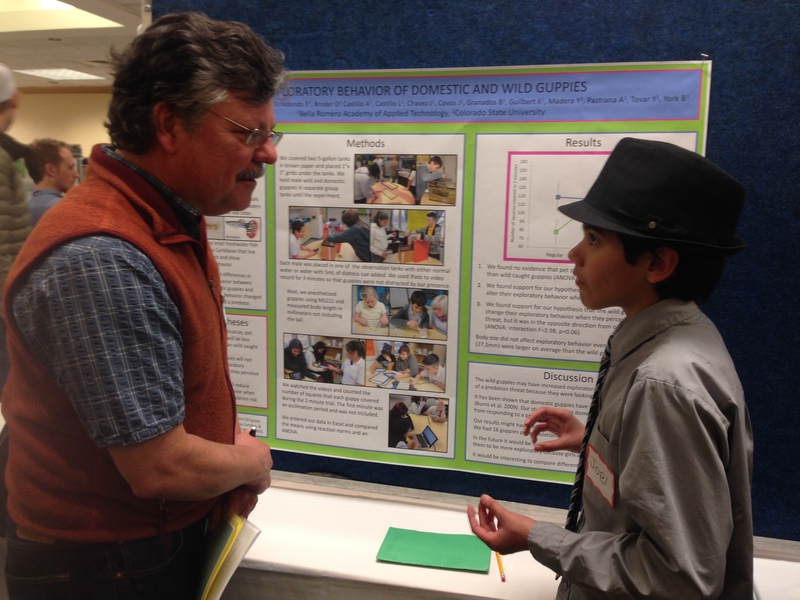 Bella Romero eighth-grader Joel Chavez presents our research to GDPE director Dr. LeRoy Poff at CSU’s Front Range Student Ecology Symposium February 25, 2015.